The bronze monument on a granite base depicts a life-size Belgian Malinois in a sitting position, vigilante, with ears perked and wearing his full deployment kit. The monument was placed as a symbol of respect and mourning for Special Operations Force (SOF) dogs that have perished in the line of duty since the September 11, 2001 terrorist attacks. Each of those dogs is represented by a paver placed around the base of the statue and includes the dog’s name, the year and theater of operations where the dog was killed. 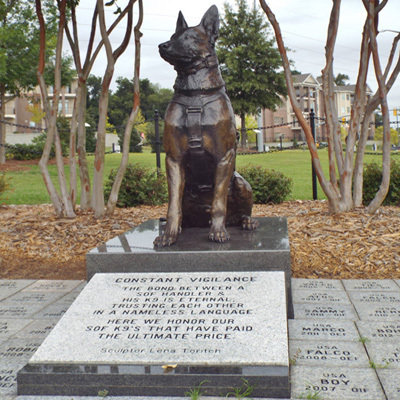 Special Operations dogs from United States allies, Australia and the United Kingdom, are also memorialized. 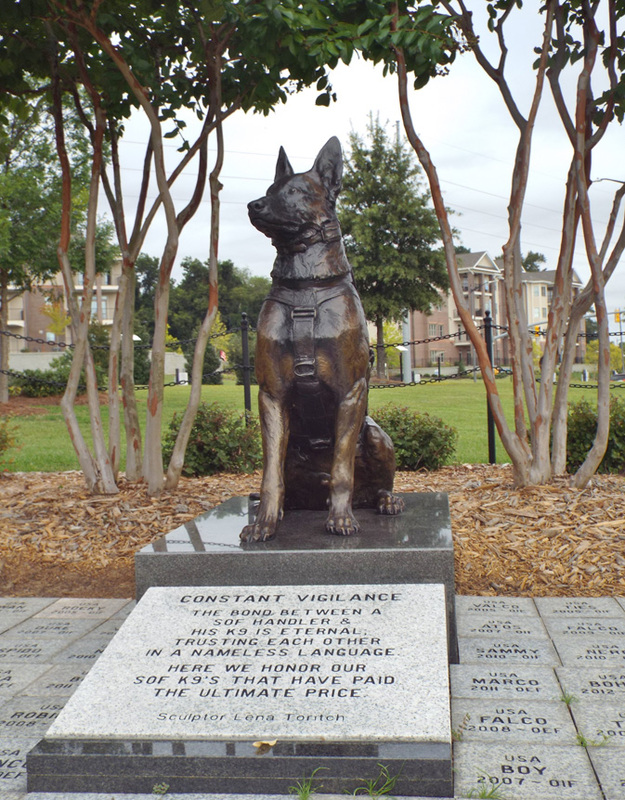 The statue was dedicated on July 27 2013, ten years to the day after the multi-purpose canine MPC, Ivan, was killed in Iraq. As of 2016 there were 62 memorial plaques. Laura Miller, Vice President of the Special Operation Forces K9 Memorial Foundation, acted as master of ceremonies and read the story of Ivan, the MPC canine, killed in Iraq 10 years prior. Among those speaking were the memorial foundations founder, Army Sgt. Maj. (Ret.) Chuck Yerry and Army Sgt. Maj. (Ret.) Chris “Dutch” Moyer a former SOF K9 handler. “Amazing Grace” was played on the bagpipes as the memorial was unveiled by Moyer and the statue sculptor Lena Toritch who said, “It took me many hours of research to depict this dog accurately. My biggest reward was at the dedication, when all the veteran handlers came to me and shook my hand, thanking for the job well done.” Bob Owen acted as Chaplain for the day and the area around the memorial had been decorated with small American Flags, tagged with the dogs’ names. Master Sculptor Lena Toritch, a native of St. Petersburg, Russia, has created several SOF K9 Military Dog Statues for different branches of the US Military including one at Camp Lejeune in Jacksonville, NC. She has also sculpted K9 dogs for law enforcement agencies across the country. SOF dogs are called “super dogs.” They are trained to jump out of a plane and can track and seize the enemy in the most difficult conditions. They are called multi-purpose canines (MPC) and are not to be confused with the more common military working dogs (MWD). The statue stands outside the Airborne and Special Operations Museum, at 100 Bragg Blvd. Fayetteville, NC 28301. The sidewalk leading to the main entrance is embedded with square marble blocks inscribed in memory of individual deceased veterans. The General Hugh Shelton statue stands down a tree-lined sidewalk to the north of Iron Mike next to a grass lawn. The Black Test Platoon Marker is nearby. The museum grounds are richly landscaped with trees, bushes and seasonal greenery. Memorial Day, Airborne Day and Veterans Day services are held annually on the museum grounds.